Nearly 3,000 people lined the streets of a North Yorkshire market town last week to welcome home from Afghanistan officers and airmen from RAF Leeming. 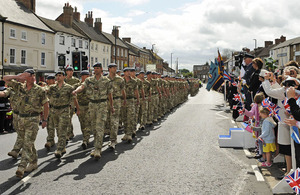 Personnel from No 2 Force Protection (FP) Wing, 34 Squadron RAF Regiment and 609 (West Riding) Squadron Royal Auxiliary Air Force paraded through the streets of Bedale on Thursday 12 May 2011. The Wing have just returned from a seven-month tour of duty in Afghanistan which saw service in extreme weather, hostile conditions and time away from their families over Christmas. 750 pupils from local schools, 350 servicemen from RAF Leeming and in excess of 1,500 well-wishers from around the region lined Bedale’s streets, joining proud parents, families and loved ones in welcoming the personnel home. 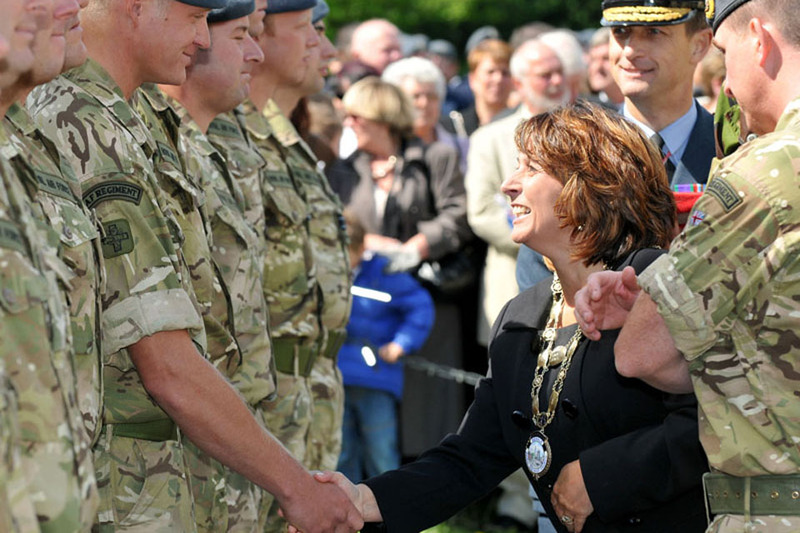 Afghanistan Operational Service Medals were also presented to 41 servicemen by Air Commodore Russ La Forte, Honorary Chief of Staff of No 2 FP Wing, and Councillor Mrs Amanda Coates, the Mayor of Bedale. No 2 FP Wing was based at Camp Bastion in Helmand province for the duration of their deployment, carrying out force protection operations in which they secured the area surrounding the airfield and landing zones in order that aircraft had a greater degree of safety when landing and taking off. No 2 FP Wing also supported the Medical Emergency Response Teams 24-hours-a-day. These teams respond immediately via helicopter or vehicle to rescue injured UK and other ISAF (International Security Assistance Force) personnel, as well as Afghan civilians. I am very proud that 2 FP Wing completed a successful tour of duty in Afghanistan and I am pleased that they have all come back home safely. The people of Bedale have once again showed us their amazing support by turning out in such large numbers to welcome us home and truly make us feel part of the community. It emphasises the strong links between the town, 2 FP Wing and RAF Leeming. If I count this as almost the final point of the tour, the high point for me is this. All of my men are back safely and the job was achieved. It’s quite overwhelming and I thought I was made of sterner stuff, but it really was quite emotional leading my men through the streets of Bedale, through a very warm welcome from the locals. It just reinforces that we are very much part of the community here. We are proud to be associated with the RAF Regiment and RAF Leeming, and are honoured to be given the opportunity to show our gratitude to the Armed Forces. We hope the special relationship between our town and RAF Leeming will endure for years to come.